School is officially back in session, and as many of us know, first-day jitters aren’t just for students. 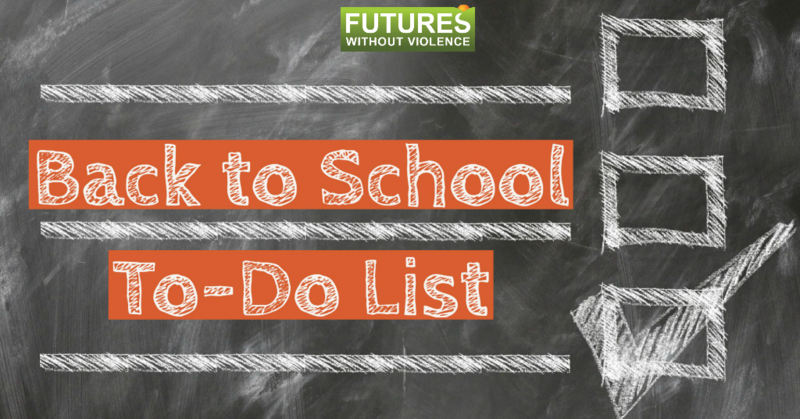 From making sure your kids make the bus to getting their preferred lunch orders exactly right, back-to-school time can be just as stressful for parents. Amid the seemingly endless list of tasks to complete before the first day, it’s easy to let some things fall through the cracks, especially something as difficult and intimidating as talking to your teen about dating abuse. That’s Not Cool — FUTURES’ teen dating abuse prevention initiative — has you covered. 2) Lessons from Literature: Want to make the 50-year-old book your kid has to read for English class feel relevant while simultaneously encouraging them to think critically about relationships? Check out this free resource, which helps students consider the relationships in books commonly assigned in high schools in the context of their own relationships. 3) Cool Not Cool Quiz: One quiz you don’t have to study for. Through relatable scenarios, this online quiz teaches teens to recognize what’s cool and not cool in regards to dating behavior. 4) Callout Cards: Time for a study break! These clever cards make it easier for teens to call out abusive behavior. They can share them on social media or print them out for a stylish and informative locker decoration. 5) Respect Effect App: Worried about what your teen might be up to on their phone? With our new app, Respect Effect, you don’t have to be! Respect Effect uses fun, daily challenges to teach teens healthy relationship habits and build self-esteem. Want to learn more? Check out this webinar we did on everything you need to know about using Respect Effect in your violence prevention work with teens. That’s Not Cool is a youth-led activism initiative, but there is always room for adults to get involved. Sign up to become an adult ally, and encourage the teens in your life to become an Ambassador.